Inside this intricately decorated black-lacquer album sit thirty-four, equally intricate hand-tinted albumen prints. Donated to the Society in 2001, the album was found in a charity shop by Jean Lowe. Though the date of manufacture is unknown, this style of photographic production was prevalent in Japan in the late nineteenth and early twentieth centuries, commonly produced as a souvenir for the burgeoning tourist market. 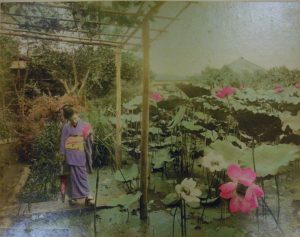 Hand-tinting was the defining characteristic of Japanese tourist photography. 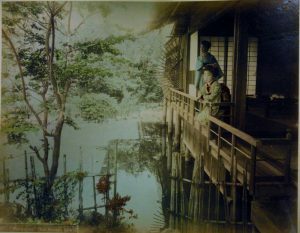 In an attempt to imbue Western photographic production with a Japanese aesthetic, European photographers such as Felice Beato hired Japanese artists skilled in painting woodblocks for Ukiyo-e prints. Popular during the Edo period (1603-1868), Ukiyo-e faced sharp decline in the nineteenth century due to the introduction of photography. 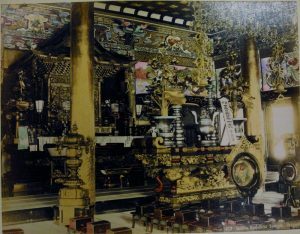 Japanese colourists worked with mixtures of water-soluble pigments, painting areas of the photograph with subtle translucent washes. This allowed details of the photograph to remain distinct rather than obscured by opaque oil paints, commonly used in Europe and the United States. This balancing act between Japanese and Western media parallels national tensions concerning the degree to which Japan should adopt foreign technology versus the desire to preserve traditions and practices. The album can be considered a by-product of the Meiji Restoration (1868-1912), a period of rapid cultural, economic and political change. 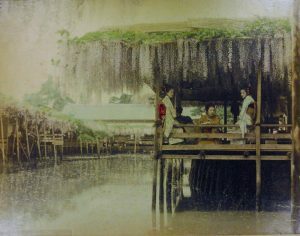 Prior to the Restoration, Japan’s policy of sakoku, or isolation, had kept ports closed to outsiders for over two centuries. The abandonment of this policy in the 1850s instigated dramatic transformations in Japan: the modernisation and Westernisation of the country began to take hold. With travel restrictions eased and trade routes open, new influences flooded in. This album captures one s ignificant aspect of the period’s modernisation: the rise of commercial photography for the tourist market. 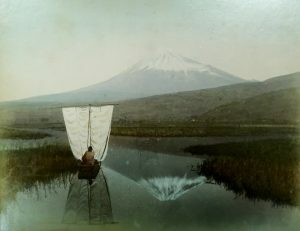 During the 1860s and 1870s, the largest market for Japanese travel photographs developed in Yokohama, flourishing in the 1880s as the number of foreign tourists increased with additional easing of travel restrictions. 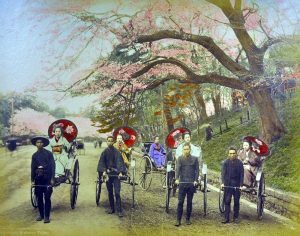 Despite the momentous changes of the Meiji Restoration, the photographs self-consciously ignore Japan’s conversion from an insular country to a modern industrial nation. Instead, they offer an impression of Japan as a quaint, archaic and idyllic country. The popular theme of Edo period Ukiyo-e prints remains: Mount Fuji for instance, the focus of Katsushika Hokusai’s infamous woodblock prints (1830-32), is represented several times in the album. 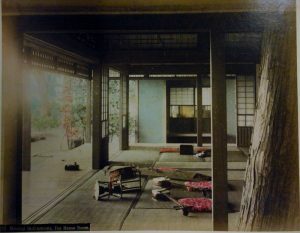 Delicately coloured images of kimonos, cherry blossoms, traditional Japanese gardens and musical instruments, simple tea-houses and elaborate Buddhist temples abound, despite the fact that much of Japanese culture, dress and architecture had been extensively Westernised by this time. Rather than focusing on the industrial growth and rapid modernisation of Japan, the photographs offer a romantic, nostalgic vision, capturing the serene beauty of the natural landscape. A view of snowy-topped Mount Fuji is intersected by a sailing boat, floating peacefully along the lake. Women dressed in colourful kimonos gaze out across the idyllic Horikiri Iris Garden and the Wisteria Gardens at Kameido Tenjin Shrine, both planted during the Edo period (1615-1869). An embodiment of calmness and serenity, the popularity of albums such as these is unsurprising: they provide a tranquil alternative from bustling modern industrial society, for Japan and Western travellers alike. Knowledge of the specific historical context complicates our understanding of these photographs. Though not immediately perceptible, the album captures Japan on the brink of modernity. The album can be considered a visual representation of the ambitions of the Meji Restoration: to combine modern advances with traditional Japanese values. The contrast between the consciously constructed classical subject matter and modern photographic production seems to both resist and accept Japanese modernisation. The photographs are, simultaneously, a preservation of a traditional culture and a romanticised documentation of Japan, intended for foreign consumption. This album is catalogued in the library, and can be found under the classification Photo.58.